Although the word predictive dialer is kind of fussy, some may think it is something that guesses the number you are dialling, but the truth it is quite another thing. A predictive dialer is just a dialer that has a pre-loaded list of numbers to dial; predictive it is just because you know what is the next number. With a little of imagination, you can set up an outbound call centre as the one described in the picture. 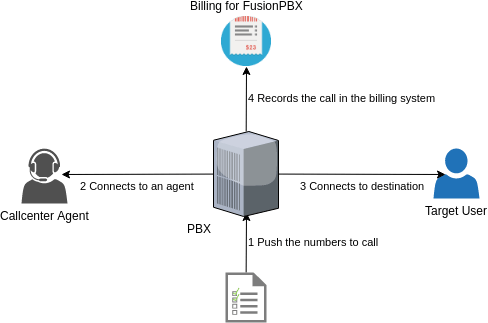 First, you need to be a little familiar with FusionPBX and Billing for FusionPBX in order to configure the call broadcast, the call centre queue and to train your agents how to log in/out from the queue. In short, you will need to create a broadcast object, link it to a call centre, and create the proper billing profile. You can use this if you only want to play a recording, instead of linking to a call centre, you can link to a dial plan with a music on hold queue. Second, and maybe the most important thing is you need to satisfy your country regulations. For example, in Canada, there is the no-call list and the anti-spam act. Your country should have something similar; the thing here is that you need to strip out numbers you shouldn't call. Always remember the rule of dumb: bigger hardware, more concurrent calls you will stand. Depending how many agents you have (which in this case means how many concurrent calls you will have) you can size your hardware. A 2 GB RAM VPS can handle 5 agents without issue. For performing reasons, you may want to use my FreeSWITCH RPM from the OKay RPM repository, which they now are linked against the gperftools.